One of the most popular Forex Strategies is trading breakouts because it is easy to implement and can produce excellent results. The main concept of this trading method is that, if a currency pair has been trading for some time within a tight range, when it does breakout it usually moves in its new direction for some time. As such, your initial step in designing a Breakout Strategy is to locate a method that will readily identify currency pairs that have been trading within a tight range for a period of time. Once this is achieved, you can then set potential entry conditions that will be activated when a breakout occurs. Although breakout trading can be applied to any currency pair, you are recommended initially to apply it to the majors. This is because traders have studied their patterns for many years and have developed an appreciation about their movements. A tight trading range of a currency pair is confined by a ceiling or resistance level and a floor or support level. Very often, a price will bounce against its ceiling or floor a number of times become it finally bursts out. For example, consider that the EUR/USD currency pair has bounced repeatedly against its resistance level at 1.4500. Should this level eventually be breached then you should consider such an event as a strong signal or recommendation to opening a new long trade. A good policy is to monitor for breakouts using technical analysis. When doing so, you should use longer time frames as they produce more accurate statistics. Many successful breakout proponents utilize the hourly or 4 hourly trading charts. In addition, they usually wait for the close of the time period during which the breakout occurs before opening a new trade. This is because this strategy allows them time to confirm that the breakout is real as well as providing some protection against false readings. The drawback against using this technique is that the possibility exists that price could keep rising dramatically and even approach your intended target before the period close occurs. If this does happen, then do not activate a new trade. More frequently though and if you do not apply patience and wait for the period close, you could be exposed to an increased risk of a losing trade caused by a false signal or fake-out. When a trade does close significantly above the breakout level, a retraction frequently happens that pulls price back to the breakout level before it proceeds in its original direction. There is much speculation that this effect is actually caused by large banking institutions that deliberately create such trading actions in order to stop out small retail traders. There is, however, no clear proof confirming this theory or any reason how larger traders could profit by doing so. If a price retraction does occur, successful traders often place an entry order at the original breakout point backed by a stop of approximately 50 pips. As a result, they frequently capture a more profitable breakout position and at less risk. If you intend to use the longer 4 hour time frame, then you may consider providing your trade more room by using a 100 pip stop. A good strategy is to place your stop about 30 pips below the floor or support level of the original trading range. Always keep your risk-to-reward and win-to-loss ratios in mind and seek better trading positions should the opportunities arise. Traders have found from experience that their breakout strategies works best when they incorporate them together with technical indicators such as resistance, support and pivot points. In addition, better results are also achieved using a strategy that is based on technical patterns such as flags, pennants and head and shoulders, etc. 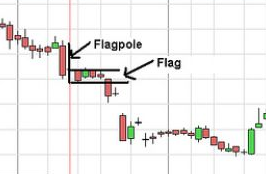 A bear flag is displayed in the following diagram. You can identify a new trade if price breaks below the support line of the bear flag. 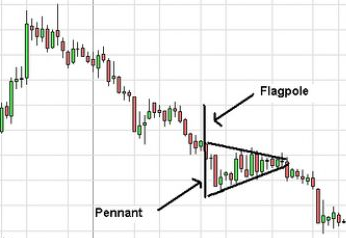 A bear pennant is showed on the next chart. You can detect a new trade if price breaks below the support line of the bear pennant. The head and shoulders pattern is displayed in the next diagram. If you identify a new trade if price breaks below the neckline creating a new bear channel. By exploiting the above concepts, you can effectively construct a profitable Forex breakout strategy.